What follows is a chronology of my trip to Australia in 2009. I transported this over from blogspot.com and put it in chronological order, which I think is a better way to tell a story. 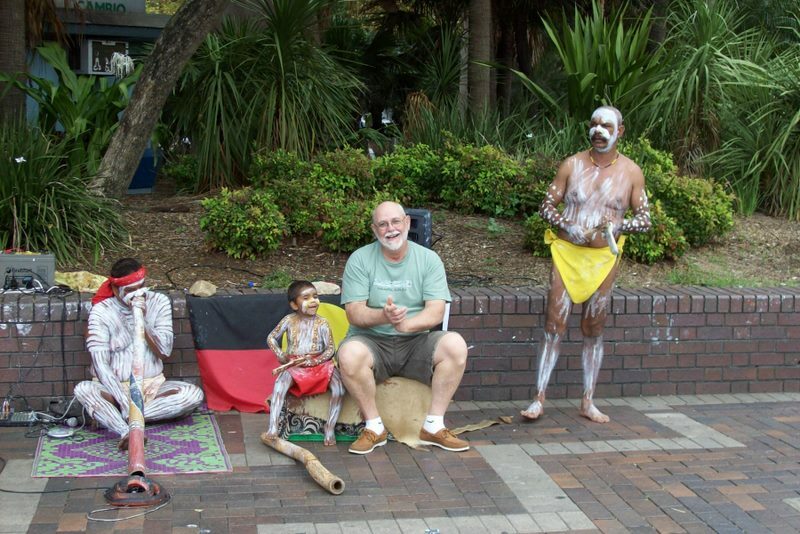 The Aussie trip was really the first of my big adventures, and it was one I had been dreaming of making for 50 years. In 2009, I finally got the chance. On March 18, I am flying out of the Providence airport on the start of a new journey. When I stop flying, it will be two days later and I will be in Sydney, Australia, where my son Matt lives with his wife Janice in the suburb of Pyrmont. I have always had a fascination with Australia since I was a teenager. Back then, the America’s Cup races were held faithfully on the waters of Rhode Island Sound, south of Newport, Rhode Island. For over 100 years, the British had mounted challenges to the holy grail of the sailing world and for over 100 years the American defenders had beaten back every challenge. Now, the British are wonderful people. But a bit reserved. They have that “stiff upper lip” thing going on in their lives. They are true sportsmen in every way and they were always gracious after failing to defeat the American team. But, there was very little “fire” in the competition. And then, the Aussies won the right to challenge for the Cup, and everything changed. They came to Newport and quickly set about establishing a reputation as hell raisers, lovers of strong spirits and rapscallions unlike anything staid old Newport had ever quite seen in yachting circles. The Aussies lost the first 4 rounds, but they kept coming back, full of determination and clever technology. One year, the Aussie crew was older than folks were accustomed to seeing in America’s Cup competition. They leased one of the big old mansions in Newport and promptly had T shirts made up that read “Daughters of Newport: Lock Up Your Mothers!” You have to admire people with that kind of spirit!!!! And then, they did it. They wrested the Cup away from the dried up old farts at the New York Yacht Club and took it with them Down Under – to Perth, of all the God forsaken places. I remember watching the members of the Competition Committee for the NYYC after the last race. They all looked like someone had taken a taser to their testicles. They were incredibly poor sports in defeat and were given to dark mutterings about “cheating”. It was embarrassing. Four years later, Dennis Connor, the skipper who lost the Cup in Newport that summer, took his new challenger to Perth and swept the Australians’ first defense of the America’s Cup, four races to none. It was a blow-out, a humiliating loss for the Aussies. The entrance to the harbor at Perth is composed of two long breakwaters that protect the anchorage from the ocean. As Connor and his crew were being towed back in after the last race, those breakwaters were packed with Australians, applauding the Americans for their win. Never in my life had I witnessed such unbridled sportsmanship. There were no grumblings about cheating and long faces, as there had been in Newport four years previously. These were people who embraced the old adage: “It’s not whether you win or lose; it’s how you play the game.” I was so impressed with the Australian culture that I made myself a promise to go there someday and experience it for myself. March 18, 2009 is that day. Ten years ago, I happened to pick up a book entitled The Fatal Shore: The Epic of Australia’s Founding by Robert Hughes . It describes in exquisite and often painful detail how Australia was founded as a penal colony by Britain. It is a story filled with bitterness, travail and strife and it is a tribute to the indomitable human spirit that a country as bold and brash and beautiful as Australia was born out of such tumultuous beginnings. From all I know of Australia to this point, I have to say to all Aussies: “Good on ya, mate!” Can’t wait to meet you all in person. Well, it looks like this is really going to happen. I have printed my e-ticket. I have my passport and a spare set of glasses. My prescriptions are all freshly filled. Lessee: bladder, arthritis, Alzheimer’s, bi-polar disorder, blood pressure, ingrown toenail and anti-fungal medications are all in order. Distemper, polio, tentanus and gamma globule vaccines are all current. Guess I’m ready to go! I’m just beginning to realize how absolutely incredible the internet is. I will be able to read my e-mail, check my bank account and upload pictures from Australia to websites here in the US. How is that possible? It makes me want to give Al Gore a big, wet kiss for inventing the internet. What did we do without it? There are a zillion little details to take care of before I go, but I am whittling down the list a little every day. I am taking one carry-on bag and my laptop. Matt informs me they have stores in Sydney, where I will be able to purchase anything that I forget to bring. Amazing! Once I get there, there is no agenda, no schedule. We are going to search out an Aussie pub that broadcasts the first Formula One race from Melbourne. Originally, I thought I wanted to see it live, but the cost of accommodations on a race weekend changed my mind about that idea pretty quickly. And honestly? You see a lot more to the action on the tube than you do sitting in a grandstand. I think being parked in a pub with a bunch of rowdy Australians will be quite an adventure! Other than that, we’ll take it as it comes. I intend to do some touring while the family does their bit for the Australian economy during the work week. Where I go and when? Dunno right now. But I’m quite sure I can find plenty to do on the internet!!!! Lift off in just under 4 days, 23 hours. Stay tuned! Heading for the airport in just over 8 hours. The suitcase is packed. Have made a list and checked it twice. The doggie always gets anxiety attacks whenever he sees luggage by the front door. His nose is placed gently in my lap, his eyes cast up at me as if to ask: “Are you sure you’re coming back?” The pellet stove is heating away in the corner. Perhaps when I return, that’s a sound that I won’t have to hear for a while. A myriad of details have been addressed and coordinated and harmonized. Notes of e-mail addresses and phone numbers tucked away. E-tickets double checked. Passport safely tucked away. My special “travelling shoes” are ready to go, the kind that slip on and off easily so I don’t spend an eternity at airport security getting dressed and undressed in public. An empty water bottle has been stowed away. All is in readiness. I expect I will be a zombie when I finally touch down in Sydney, 2 days from now. I see the road ahead is turning. I wonder what’s around the bend? Well, modern technology has prevailed once again, and I have been delivered without incident to the Land Down Under, where it is a balmy 85 degrees at present, or roughly 45 degrees warmer than what it was when I left home. The flights to Detroit and then LA were uneventful. Detroit has a really nice airport with very modern in-terminal transportation devices to speed you from gate to gate. I thought of having dinner there. They have some very presentable restaurants. But I elected to wait til I got to LA, on the theory that a good meal just before a 14 hour flight would be a good thing. Big mistake. LAX is the WORST airport I have EVER been in. Worse than Panama, or Cancun or Saigon! There were NO restaurants past the security check point. The entire place was under construction. And the traffic at the gates reminded me of nothing so much as the airport scene at Cartagena in Romancing the Stone. I finally found a bratwurst with onions and peppers, with a bag of chips and cranberry juice for 12 bux. It wasn’t the worst wurst I ever had, but it wasn’t all that great either. There were no tables available, so I had to eat standing up next to the trash with people swirling all around me. The plane was a mile away from the gate, with giginormous buses to take us out to the stand-alone terminal. The buses had no seats. We all stood like hogs on the way to market. I was way, way underwhelmed with LAX. The flight itself, though, was superb. I was on a 747 that was only about 50% full. The seats were wide and comfortable. The Quantas service was impeccable. The entertainment selections were plentiful. Mostly, I put the audio channel on the “New Age With Peruvian Pan Flutes” channel and just drifted in and out of sleep for the 14 hour and 10 minute crossing. We did encounter some significant turbulence southwest of Honolulu. It was as bad as I have ever experienced on an aircraft, which is probably about 2% of what the plane is capable of tolerating, but it did make me offer up a paean to the Great Spirit that the adhesives used to glue the plane together were not concocted from a pastiche of pig poop and yak spittle. And that the bolts holding the thing together were not bought from a conglomerate who got them from a company that obtained them from a consortium who bartered for them with a man who made them in his backyard blast furnace somewhere in Jerkajerkastan. I actually arrived feeling pretty refreshed, which is rather remarkable, considering I had been sitting in an airplane seat for the better part of 24 hours. I even got to watch Dirty Harry again. What a great movie! The one thing Matt and I didn’t do much of was plan where to meet at the airport. After getting out of immigration, I scanned the crowd but didn’t see him. But a few minutes later, there he was, right on time. So, I’m at his apartment in Sydney right now, posting this up so that all of you who feared my plane might somehow end up in the Coral Sea can put your minds to rest and go to bed. More when there is more. G’day, mates! 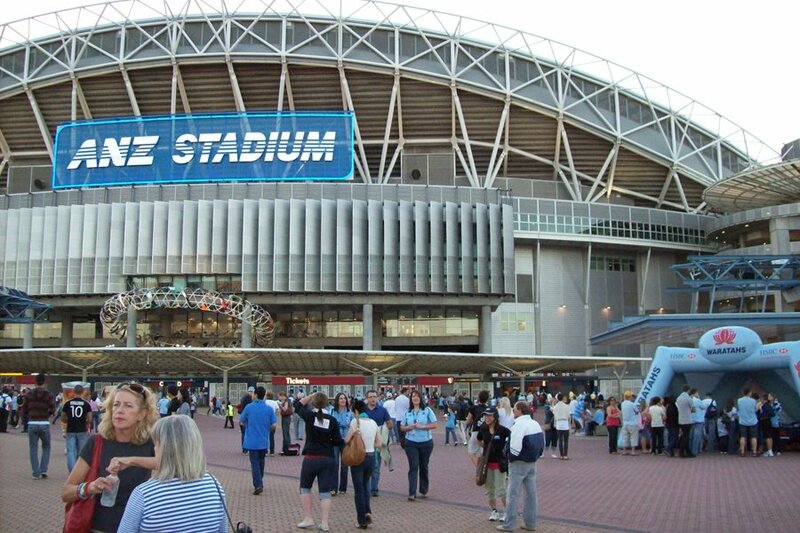 Went to my first ever rugby match at Sydney’s Olympic Stadium for a match between the Sydney Waratah’s (known locally as just “The Tah’s” and the New Zealand Crusaders. As a complete neophyte when it comes to rugby, I even understood a little of it and actually cheered once or twice at the right time! Although the crowd was equivalent to a sellout at Fenway, the stadium was only about 40% full. Probably seats about 100,000 or so when full. The Aussies are quite well mannered. 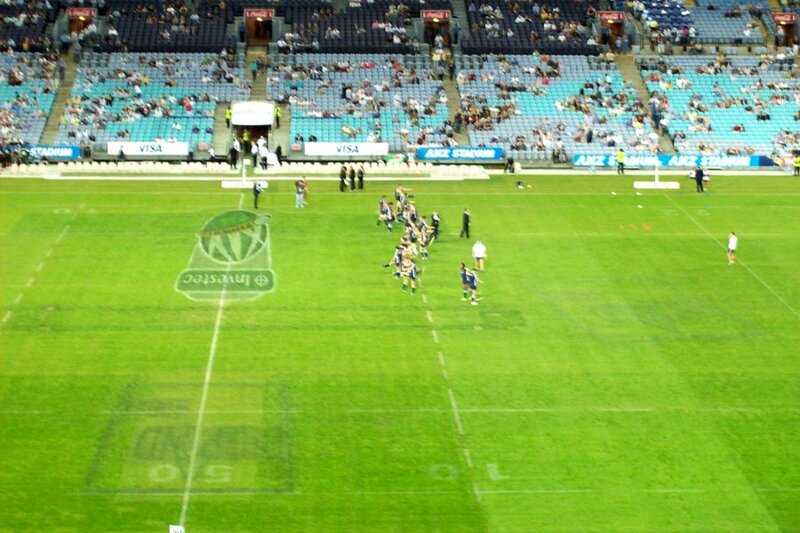 After the match, the stadium empty out quickly and efficiently. We took the train back into the city and were home about a half hour later. This morning features a bright blue sky with nary a cloud between here and Macao. Will probably take a stroll through the Botanical Gardens later today and will share some pictures of that with you soon. Took a stroll through downtown yesterday, including Chinatown. Sydney has a rather appealing blend of the old and the new. Rather than try to upload all of them, I put them all on PhotoBucket. To see them, please follow this link: Sydney. The highlight of the day was viewing the Sydney Opera House up close and in person. What a magnificent structure! Monday, March 32, 2009. A.M.
Back in the 70’s, America was treated to a song called “Do You Come From A Land Down Under?”. In it one verse goes like this:”I said ‘Do your speak my language?” He just smiled and gave me a vegemite sandwich. 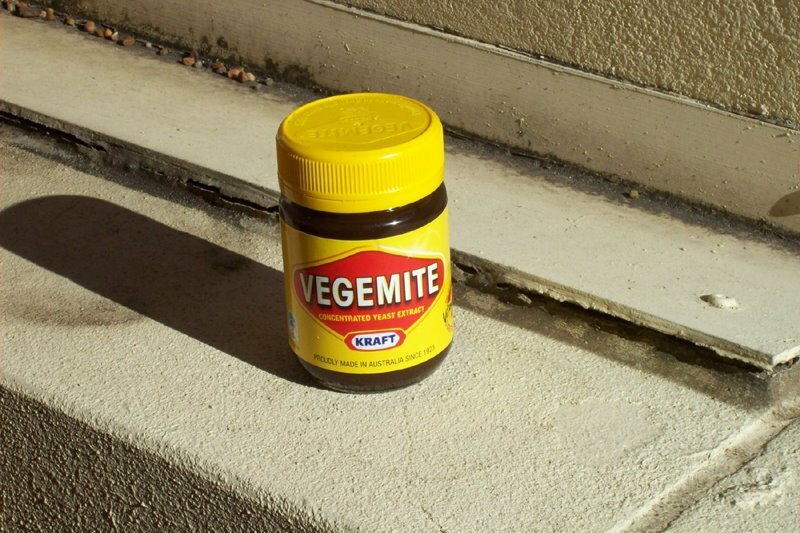 Of course, no one in America has a CLUE what vegemite is, but its the national dietary supplement of Australia. The label says it is “concentrated yeast extract”. Well, beer has yeast and I like beer, so….. Yesterday, Matt made me toast with some vegemite spread on it. It was spread thinly. One doesn’t ladle it on they way we do with peanut butter and jelly. A little dab’ll do ya, and then some! Its dark brown in color and the taste? Somewhere between anchovies and kippered herring. Matt tells me that it gives a person extra energy. Yesterday, we toured the Harbor, drank some beers, walked some beaches, ate dinner and watched a movie. All without my regular afternoon nap! Wow. There must be something to this vegemite stuff. Yesterday, Matt and I took the ferry up to Manly, which is about 10 miles north of the City. The Opera House is right next to the ferry pier, which is located at Circular Quai, pronounced “key” in these parts. Across from the Opera House is the Harbor Bridge, a landmark of Sydney. So, within 5 minutes of leaving the pier, I had a marvelous view of both. Sydney Harbor has GOT to be one of the nicest, cleanest, most beautiful harbors in the world. Like Seattle, it has ferries running every which way all day long. And like San Francisco, the shores are clustered with the bedroom communities that serve Sydney. To say it’s picturesque is like saying Babe Ruth was an OK batter. Bit of an understatement, in other words. Manly, once we arrived about a half hour later, is one of those places that, after about 3 minutes ashore, a person is apt to say: “Oh, yeah. I could live here.” Quaint, clean, bustling but not in the way the City is. Bayside beaches. Oceanside beaches a quarter mile away. Tons of small hotels, eateries featuring food from all around the globe, and pubs with a dozen or more beers on tap. 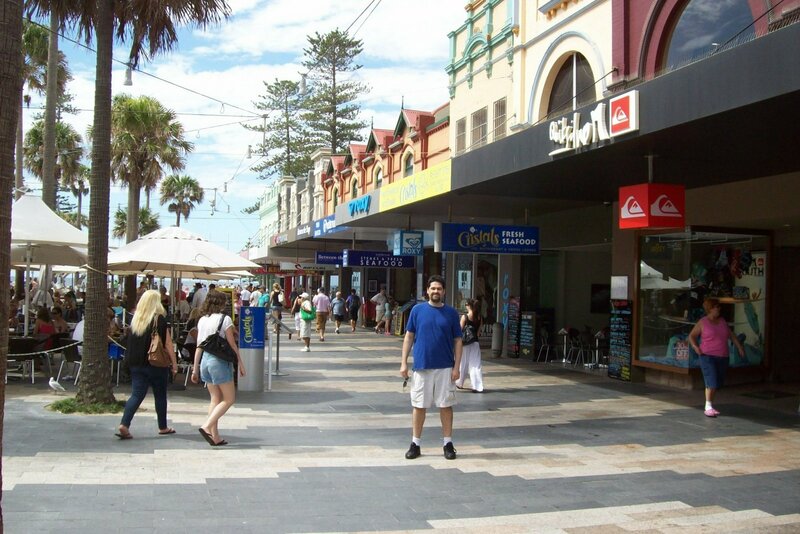 Above is a picture of Matt on the pedestrian mall between that runs between the harbor and the ocean. Lots of surfers at the ocean beach. The place is quite a tourist destination but not a honky-tonk, trinket driven economy as we are used to. Looks like a most pleasant place to live. Sydney Harbor is crisscrossed by multiple ferries that are part of the public transportation system. On the way back from Manly, we took a ferry across to Neutral Harbor and to Darling Harbor area near where Matt and Janice live. At one of the ferry stops in Darling Harbor, excerpts from the diaries of early settlers in Australia are inscribed on granite slabs. Tuesday, I was on my own for the first time. I have purchased a 7 day Transit Pass that gives me unlimited access to every bus, train and ferry in the Sydney area. Some of the trains go to places that are as much as 80 miles distant, so its not quite like the subway in New York or Boston. I studied the transit map and decided I wanted to go the end of the line. Not just any line. One that ended at the ocean. I wanted to see what a typical oceanside community would be like. My finger landed on Cronulla, about 30 miles southeast of the City. I am getting to be an old hand at navigating Central Station. EVERYTHING that is train related goes to or through Central Station. In Boston, you have North Station and South Station. To get from one to the other requires several subway stops, an expensive cab ride or many buses. Here, the trains from north and south go right through the station, which uncomplicates things a great deal. Its similar to Grand Central in New York, but only about 1/10th the size. The trains here are clean and quiet. Riding along reminded me of taking the train from London to Heathrow. The houses are neat, orderly and set very close together. Nothing is made of wood here. Everything is brick or masonry or concrete. All the roofs are tile. I suspect that A.) there are not a lot of trees in Australia and B.) the sun blasts anything so the exterior surfaces had better be durable. I disembarked in Cromulla and started walking toward where the sea should be. Almost everything is condo towers, from 2 to 10 stories high. Most of the roads I was on were dead ends, but after about 15 minutes, I came to one that had ocean at the end of it and the distinctive aroma of salt water tickled my nostrils. The first picture in today’s gallery was taken at the end of that street. Cronulla is very much a retirement community. It’s where Aussies come to soak up the sun and watch old Paul Hogan movies. There is a wonderful wide concrete walkway, called The Esplanade, all along the shore, with benches looking out to sea every so often. It reminded me a lot of Marginal Way in Ogunquit, Maine. Even the shore was rocky and craggy, just like Maine’s is. And the benches have plaques affixed to them, in memory of a Cronullan now departed. Very nice and peaceful. After about a mile, The Esplanade brings you to the large, wide beach at the edge of town. There are galleries filled with arts and crafts and plentiful seaside bistros for dining or quaffing a beer or two. On the beaches, school children assemble under the watchful eyes of life guards who double as day care mothers and keep the children active and entertained during the afternoon after school lets out. For many in Australia, life IS, indeed, a beach. Cronulla was not quite the hip, happenin’ place that Manly was. It is much more peaceful and serene, as befits its older population. Those of you who have ever been to the Gulf Coast of Florida from Indian Rocks Beach down to Venice and Naples will know immediately the look and feel of the place. The similarities are striking. 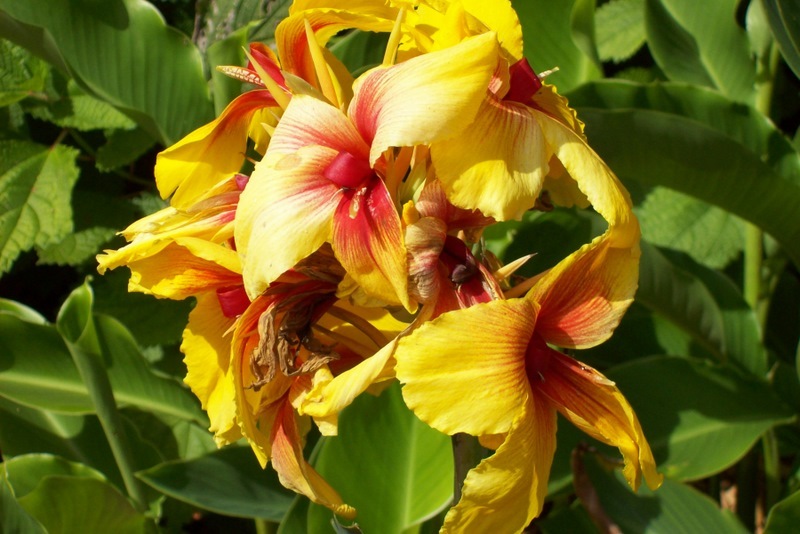 Today, it was time for the Royal Botanical Gardens, a vast reserve of greenery just steps from the central business district that is a square mile or more in area and packed with lush vegetation and many shady places to sit and let the world roll by. I saw one gal taking a nap up in the mighty arms of a giant water gum tree. The Gardens abut the Opera House, which abuts Circular Quai, which is where the ferry piers are located. Since I have my all inclusive transport pass, I elected to let the ferry folks take me across the harbor to North Sydney to see some of the sights, and then bring me home to Darling Harbor. Doing so, I discovered the Australia Welcome Wall, with the names of many of the immigrants, settlers and convicts who came to this land between the 1800’s and today. Many of their comments have been preserved in bronze tablets. I took photographs of some of them. Quite a moving spot, all in all. On the way back, I was stopped by two older gals looking for directions! They said they were from “the countryside”, meaning somewhere outside of Sydney. When I said that I was from Boston (close enough) they were perplexed for a moment, until they realized I meant THAT Boston!!! Another positively gorgeous day here in Sydney. There were some lightning and thunder last evening, followed by about ten drops of rain. But this morning, the skies are clear and blue once again. I think I could like it here! Thursday found me lusting to point my finger at the transport map and just follow it to some new place again. There are three criteria for these adventures. 1.) The place has to be on the ocean. 2.) It has to be at the end of a rail line. And 3.) It must be someplace I have not been before. This day, the spot selected was Newcastle, about 80 miles northeast of Sydney. I don’t know why. I know nothing of the place, other than that it meets my three criteria. Well, as I headed north, I noticed that the time was getting later and later. My transportation map doesn’t show all the stops on the line, so I really had no idea how much further it was to Newcastle. But the conductor kept calling out coming stops and NONE of them were Newcastle. Matt and Janice and I had plans to go out for pizza that night. I had no phone and no ‘puter, hence no way to contact them. Otherwise, I would have gone on to Newcastle, taken a hotel and returned the next day. But, being out of touch, I was concerned that they would be worrried about me if I just failed to return from my day’s adventures. And so, at 3:30, I got off the train at a nowhere nothingness called Cockle Creek, switched to the other side of the tracks and waited for a train heading back to the city. Essentially, I more or less wasted a day riding the rails. But not entirely. 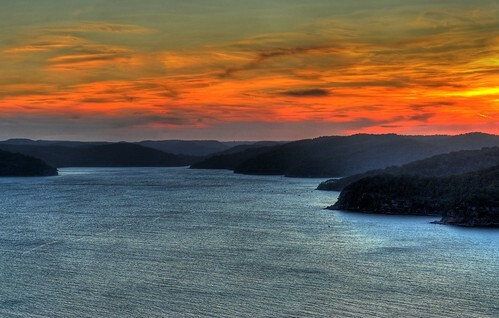 Because along the way, I discovered an area known as the Hawkesbury River, which leads inland from the sea about 20 miles or more. From the flatness of Sydney, I suddenly noticed that the landscape had changed into a succession of crenellated hillsides with many valleys and a large body of water in between. It reminded me of some place I had seen before, but it took me several minutes to dredge up that recollection from the dim recesses of my brain. In Nova Scotia, on Cape Breton Island, there is a vast inland sea known as Bras D’or, or, in French, the arms of gold. I realized that what I was seeing was very, very similar to my memories of Bras D’Or. Taking pictures out of train words is not usually a way to get good results, especially when moving. And so I have pressed Google Images into service here, so you can get an idea of what I saw. So my trip to nowhere really was not all for naught. I’m going back next week and will spend the night in Newcastle. And I will stop in the Hawkesbury River region to get a better look at it from on the ground. Stay tuned! Friday was spent exploring The Rocks, an area that was the first settlement in Sydney. I have included most of my commentary in the associated webpage, so I won’t repeat it here. Sydney has a rich multi-national tradition. We in the US like to talk about our melting pot, but here, people from all over Asia, Africa, the Middle East, Russia, Europe and the UK all mesh together. Tonight, its off to hear Beethoven at the Opera House. Now THAT should be an experience! Today, Saturday, we all drove out to Farmington, about 12 miles west of the city, where the farmer’s market is held inside a large building that obviously used to be a “big box” store, like a WalMart or a Costco. Acres of fresh food literally as far as the eye can see, and proprietors hawking their wares like auctioneers at a southern tobacco auction. Anything and everything you can think of is on offer and at pretty reasonable prices. Keep in mind that all the signs you see are for a kilo, which is 2.2 pounds. So translating into our terms, if something is $10 a kilo here, that is equivalent to $4 a pound back home. The shoppers are offered samples of anything they may fancy. And they feel free to inspect every purchase for smell, texture, color, firmness and porosity before buying. Merchants sometimes stand on their tables and shout out their wares. Dollar! Dollar! Dollar! Two dollar – box. 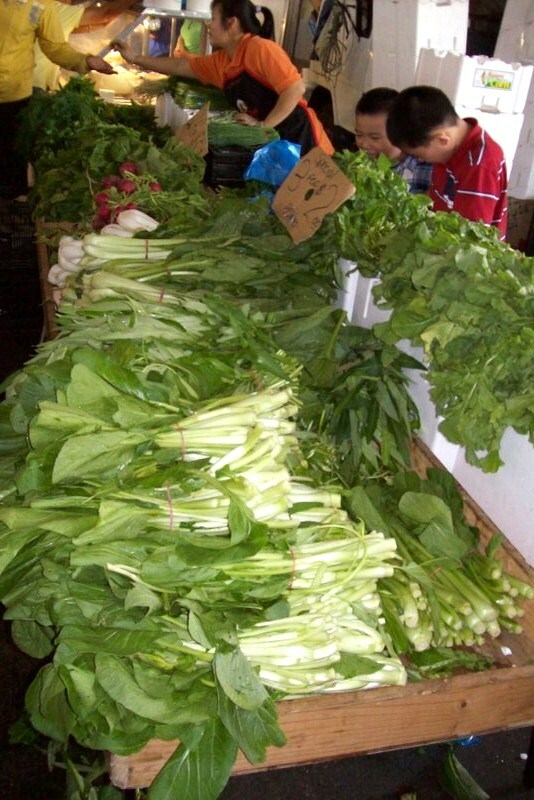 Four dollar – bunch! The noise is constant and oddly appealing. There is a blend of languages going on all around: Asain, Turkish, Greek, Arabic, Italian. Even a smattering of English now and again! On the way out, a couple in front of us had a box of oranges fall off their cart and spill all over the parking lot. Instantly, 7 people stopped what they were doing to help round them up and put them back in the box. Back home, people would gladly run over them with their SUV and think nothing of it. Australia is a very pleasant place to be. 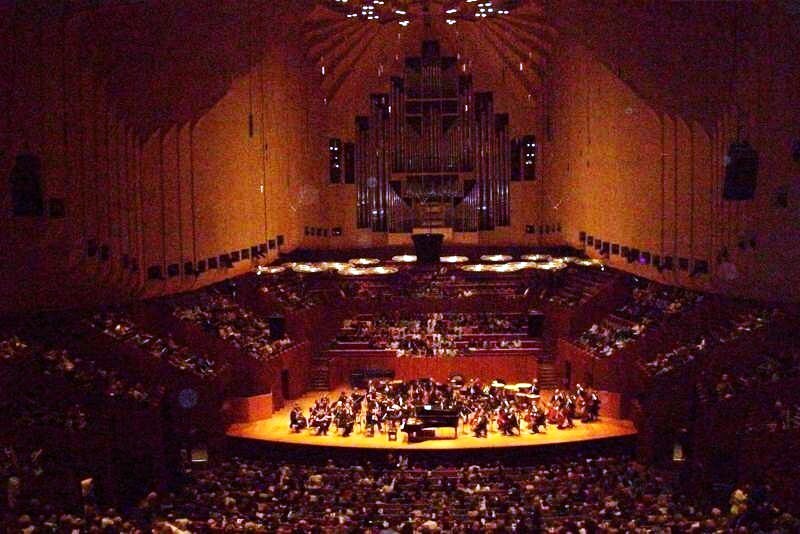 Tonight brought the fulfillment of a long time dream of mine, to hear a performance at the Sydney Opera House, reported to offer some of the finest acoustics of any venue on Earth. It was a sell-out performance and we had seats in the center of the hall, albeit near the back. The first selection was a Beethoven piano concerto. Some passages were so soft, it was as if the pianist was barely brushing the keys with his fingertips. But we heard every note as if we were up on the stage with him. Awesome! Magnificent! Incomparable! The trip was worth it just for this one moment. The second selection was a Haydon piece that featured passages with just two violins softly playing off each other in contrapuntal fashion. Stunning! Every note so clear and precise. What a magnificent structure this Opera House is. Bravo!!!! We befriended an Aussie couple sitting next to us and we all went out after the performance to Circular Quay for a drink on the harbor’s edge under the stars and moonlight. Was this a special night? Oh, yes, indeed. One I will never forget. Words can’t describe how magnificent this evening was. Sometimes dreams really do come true. Sunday, we all took a road trip along the shore of Sydney Harbor to the east, circumnavigating the many coves and inlets along the way and ending up at South Head, the southern side of The Gap, where the harbor meets the ocean. From there, we wandered south to Bondi (with a long “i”, as in “island”) and its spectacular ocean beach. 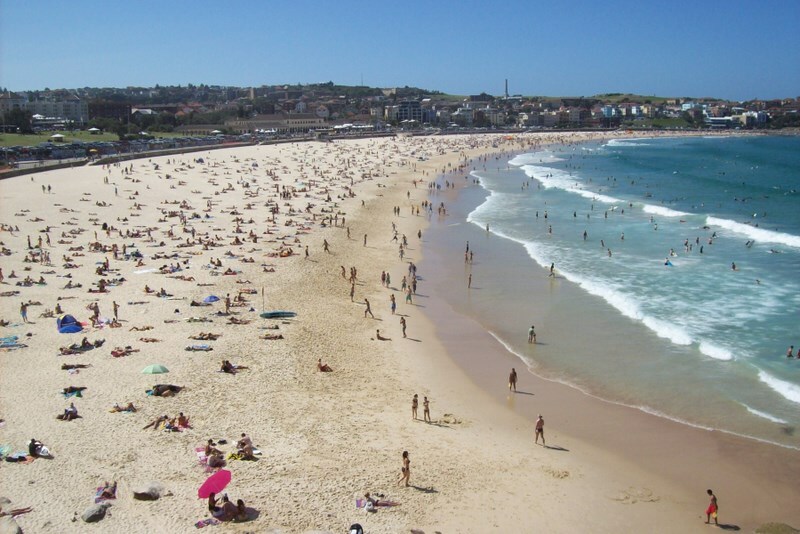 Unfortunately, the day was wonderfully warm and sunny and Bondi beach was overrun with locals, to the point where the nearest parking was in New Zealand or someplace. There sure wasn’t any to be had in town THAT day. So we wandered further south to La Perouse on Botany Bay, where a colonial era fort guards the entrance to the bay. There is also a national park there. The whole area felt very much like Brenton Point, in Newport, RI, where Narragansett Bay meets the Atlantic. Same greenspace, same steady, prevailing breeze off the water, and same virtually unlimited scenic view seaward. Then we headed back north again to the beach at Maroubra, which features a beach nearly as broad and inviting as the one at Bondi, except this time we were able to find a place to stash the car so we could take a refreshing swim in the Pacific. And man, did it feel good! On Monday, Janice took the day off from work and we all took the ferry across the harbor to Taronga Zoo, where we focused on the native Australian species like wallabys, kangaroos and wombats. As you will see in the pictures, the zoo offers a rather wonderful view back over the harbor toward the City, which my Kodak was happy to record just before the batteries finally gave out after 10 days of almost constant use. Carolyn e-mailed me last week to ask if I had found the place I wanted to live in Sydney yet. Today, I found it! 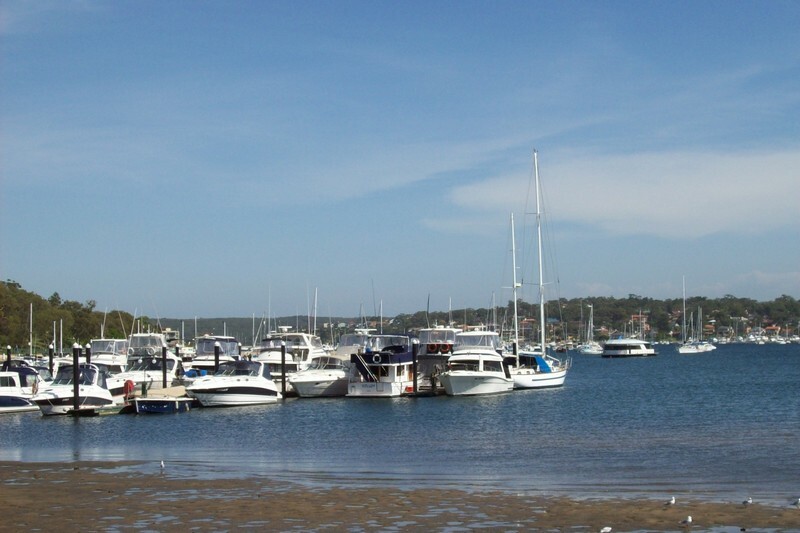 Its called Mosman and the adjacent Mosman Bay. 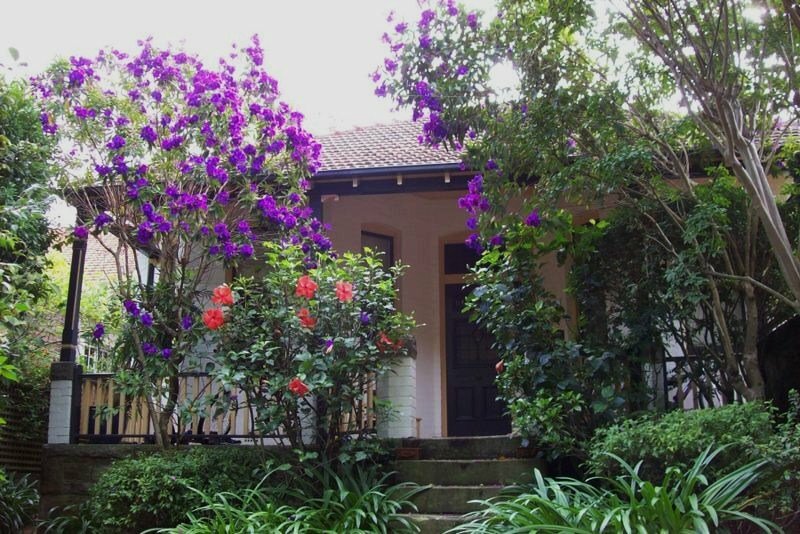 Cute, clean, quaint, close to the city, lots of quiet, tree lined streets, an extensive main street with oodles of shoppes and the prices seem about 20% less than in Sydney proper. Some of the photos are of waterfront homes along the Bay, and I rather think they might be a bit dear for our projected budget. But just up the street and around the bend, there is an assortment of single family and duplex dwellings that are quite appealing. The fact that you can easily take a ferry or a bus into the city is also a drawing card, as parking in Sydney, as in most large cities, is a challenge. The weather has changed since I talked to you last, which is why there was no update yesterday. It rained the day before and so, for the first time since I got here, no photos were taken. Yesterday was overcast and threatening more rain, which came in the night. So the exposure on today’s pictures is not ideal, but the best I could manage given the conditions. Do You Know The Way To Double Bay? Here’s a collection of photos from various points around Sydney over the past two days. 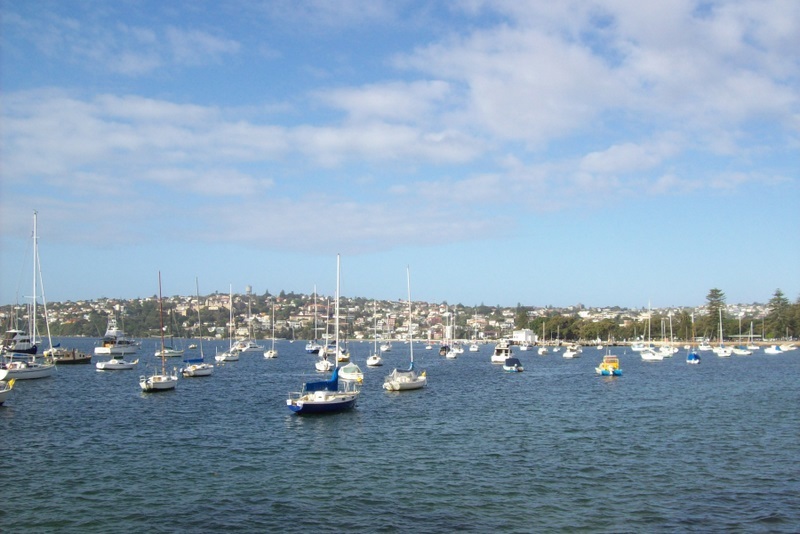 I have made it my mission to ride every ferry route on Sydney Harbor, and part of that included the ferry to the eastern suburbs called Double Bay and Rose Bay on Thursday. But that trip was preceeded by an excursion through Hyde Park and another part of The Botanical Gardens on the way to the ferry terminal. The next day, Friday, we all went for lunch in North Sydney at a Chinese restaurant where they wheel the food by your table on carts and you simply select what interests you. It was a great meal and a most entertaining way to while away an hour or two. On the way home, we opted to take the one remaining ferry adventure and saw some of the upper harbor, which extends as much as 15 miles inland. I’m getting so I rather like this city life. So much to do and to see. And of course I have to make sure to capture all of it to share with you. Hope you have enjoyed the trip. Its rapidly drawing to a close, sadly. 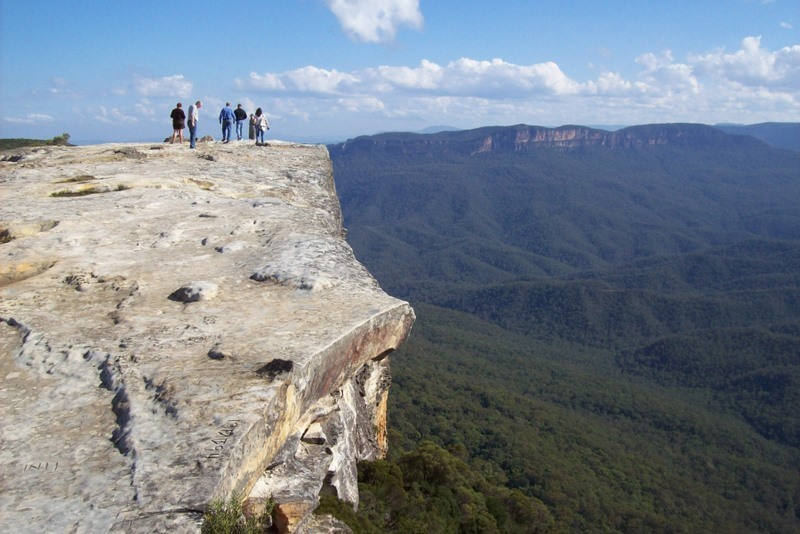 Tomorrow, Sunday, we are off on an all day junket to The Blue Mountains west of Sydney. Don’t know what we will find there but you can be sure I will record it all for your amusement and edification. See you then. 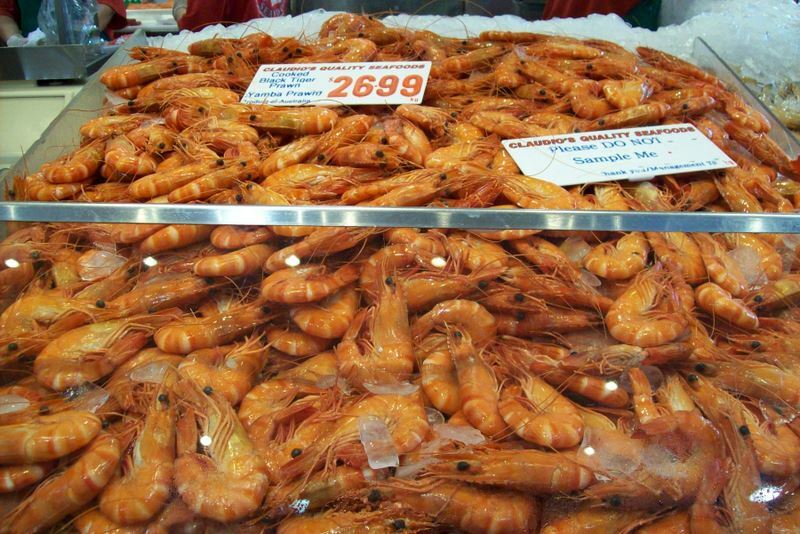 For those of us who live in the US and are pretty much used to having all our food portioned, packaged and pre-chewed, its a bit of a shock to go to the grocery market like we did last week or to the fish market here in Sydney, where most of the fish is offered up fresh and whole. I wouldn’t now how to clean a fish if you threatened me, but if I lived here, I’d have to figure it out or starve. A short course in fish nomenclature would probably be a good idea as well, as there are varieties available that I know nothing about. Anyone for a nice barramundi fillet, for instance? Keep in mind that the prices in the photos are in kilos, so with the exchange rate and the conversion to US dollars, our price per pound would be about 40% or less of what you see in the pictures. In addition to buying your seafood, you can also dine at the Fish Market pier at any number of restaurants that offer entrees that are fresher than anything you can find at home, if you can find it at all. Australia has great geological diversity. Sydney is built on a plain, but 80 miles to the west, the land rises up to over 4000 in elevation, with deep gorges that resemble the Grand Canyon and Hawaii’s Waimea Canyon on Kuiai. On may last day, Janice and Matt and I took a tour of the area, which is a popular sightseeing destination for city folk. Nigel, our driver and tour guide, regaled us with historical anecdotes about the terrain and the people who carved out their living there by mining coal from some of the most inaccessible in the world, dug into the cliff face from the side of a steep gorge. How they got anyone to do that enormously difficult job is a great mystery to me. And so, my grand adventure to Australia comes to a close. I am sad to leave and anxious to return. I am enormously grateful to Matt and Janice for being so warm and welcoming. They made my journey everything I had hoped for and so much more. Thank you both for your kindness and hospitality.